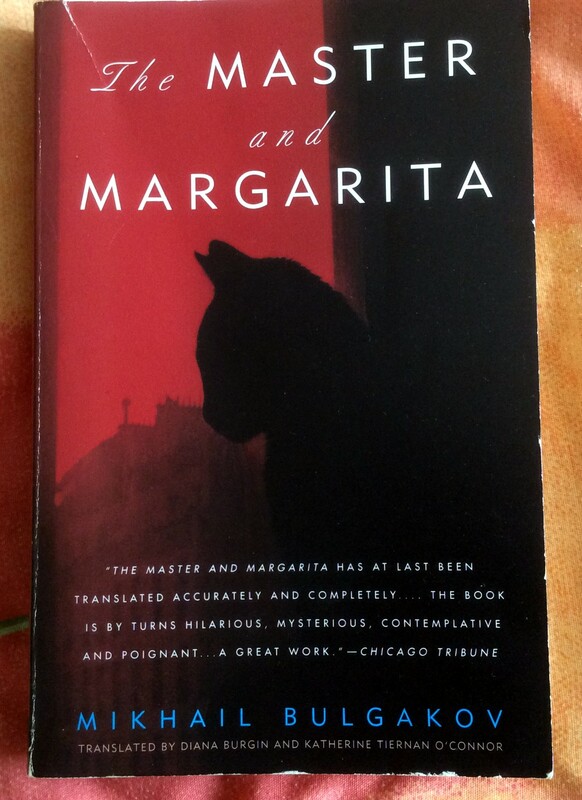 One of the things I’ve been promising myself for some time now is a re-read of Bulgakov’s masterwork “The Master and Margarita”. It’s a book I read and loved many years ago, and then fell in love with again more recently when I watched the 2005 Russian TV miniseries. The time had to be right, though, and recently when I was between books and unsure, I just picked it up and started reading. And, oh my! Am I glad I did so! 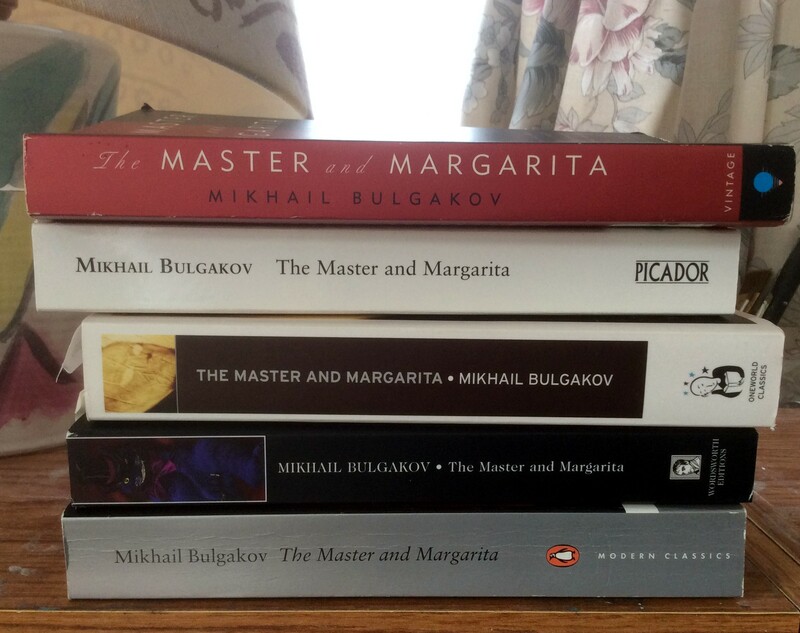 “The Master and Margarita” was unpublished during Bulgakov’s lifetime (and could perhaps be regarded as unfinished, only finally coming to print in the 1960s. Summarising it is not easy, but here goes nothing. One hot spring evening in 1930s Moscow, the Devil materialises in Patriarch’s Ponds, along with his retinue: an unpredictable and manic ex-choirmaster called variously Korovyev or Fagot (bassoon); and a large black cat called Behemoth with a habit of walking around on his hind legs, a fondness for vodka and a very garrulous tongue (he’s also a bit of a pyromaniac!). Encountering a proletariat poet Ivan Bezdomny (Homeless) and a literary editor Berlioz, they debate the existence of God and the Devil. The narrative then takes a turn into a story of Pontius Pilate, which runs through the whole work, related sometimes by Woland (the Devil), sometimes in a book by a writer known only as the Master, and sometimes in dreams. Woland and his retinue (mainly the retinue, to be honest!) proceed to cause havoc, death and destruction in Moscow. Ivan ends up in a clinic, where he encounters a mysterious man known only as the Master. The latter is the author of the story of Pilate, but has been crushed by the vilification he received by the critics and authorities, and is separated from the woman he loves and who loves him – Margarita. 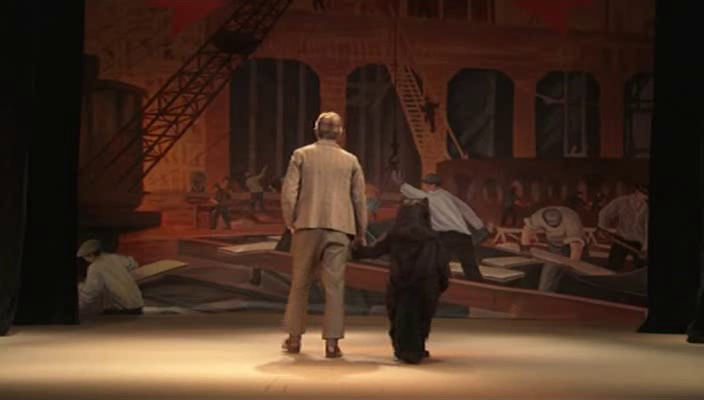 The tale rushes on, with Woland’s Midnight Ball taking place, where Margarita is hostess and greets a hideous collection of the dead; Korovyev and Behemoth cause havoc wherever they go; Pilate searches for peace and revenge; and Margarita seeks to be reunited with the Master. Can peace be restored to all and will Moscow ever recover from the confusion? That’s some of the bare bones of what is a rich, complex and quite fascinating novel, but I’ve barely scratched the surface. And yet, despite its complexity and length, I found M&M incredibly easy to read. It’s full of the most wonderful set pieces – a ‘magic show’ at the Variety Theatre, where Korovyev and Behemoth play tricks on greedy Muscovites, while Woland gets the chance to observe them; Korovyev and Behemoth’s visit to the Torgsin store (which you just *know* will not end well); Margarita’s flight through night-time Moscow and her revenge on Latunsky; the execution of Yeshua; well, I could list them forever! So you might think from some of the initial impressions you get that this book is just a wacky satire, and that is one of the superficial elements; but it’s also very deep and has much, much more than just historical high-jinks. 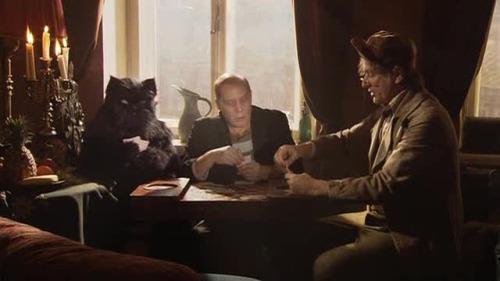 On a basic level, the Master can be taken as a self-portrait of Bulgakov (and I hadn’t realised quite how much on my first read of this book, but this became much clearer after having read his letters and diaries). Persecuted by the critics, unable to publish or make a living, the Master has struggled to create his mammoth life of Pilate, only to have it torn to pieces. 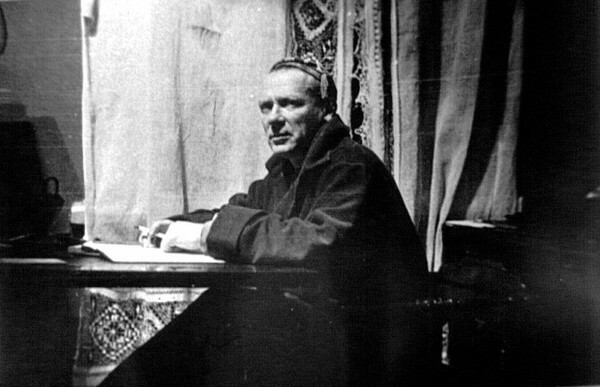 He does not survive the attack (unlike Bulgakov, who fought on to keep writing, composing this book right up until his early death), and ends up in the clinic, broken and unwilling or unable to consider writing again. However, he could also stand for any number of Russian writers who were persecuted, and with the burning of manuscripts (which Bulgakov also undertook) you could draw a parallel with Gogol, who indeed burned the second part of his great work “Dead Souls” so that we’ll never know what was to come next. Bulgakov is obviously using his work to critique the Soviet regime, and cleverly much of his comment is hidden in the Yershalaim sections of the book: a repressive regime (the Romans), arrests, torture, execution, spying and betrayal. The section where Pilate discusses the fate of Judas with the mysterious executioner Afranius is a model of double-speak, with even the chapter title being ironic, and it’s hard to see how this could ever have been published during Stalin’s time (but then Bulgakov did know that he was writing for the drawer). and he’s right. Human beings can’t imagine heaven (the subject of an interesting recent post here) and we can’t imagine a world without striving and searching. So although we follow the Yershalaim sections of the book, thinking that we know what’s to come, our perceptions become skewed as we’re constantly reminded that this isn’t the familiar Biblical tale we expect. Interestingly, the more obvious Biblical elements in fact turn up transposed into the Moscow sections (a last supper with 12 attendees for example). M&M works on so many different levels that it’s hardly surprising it took Bulgakov from 1929 till the end of his life to write it (and he was still revising it at his death). You can read it simply as a very funny satire, as its portrait of bureacracy-bound 1930s Moscow with its niggling regulations and pomposity is unparalleled; you can enjoy the wonderfully joyous romp as the characters cut through the pettiness of Soviet daily life; you can look at the criticisms of the regime hidden in the book and get a real feeling of what it was like to live under such an authoritarian system; you can enjoy Bulgakov’s take on the historical story of Yeshua; and you can see the painful struggle that Bulgakov and other authors had to try to create their art and have it recognised. But more than anything the moral element shines through; the need for integrity, for tolerance, for a world where light and shade both exist to balance each other out and where humans can put aside their difference and trust one another. It is the *system* that prevents Pilate from saving Yeshua from execution, an event which will torment him for aeons; when all he wanted to do was walk with the preacher and talk with him. In fact, Pilate emerges from the book as a genuinely tragic character, and the resolution of his story is one of the most moving parts. There’s so much more I could talk about: Bosoi and the currency; Varenukha and the vampires; everyone wanting reinforced cells; Bulgakov’s incredible use of the imagery of weather; the Moscow housing crisis (which turns up in every one of his books, it seems! ); the significance of primus stoves; the motif of composers’ names for characters (Berlioz, Stravinsky, Rimsky); other recurring motifs (sun, moon, knives, roses, severed heads); the fate of Ivan; and of course the influence of “Faust” (Bulgakov was fond of the opera and the legend); but I fear there’s enough in this book for several university theses! “The Master and Margarita” is truly a masterpiece; this is only my second read of the book, and already I feel I understood so much more from this time round. The characterisation is superb: all of the players leap off the page, alive and real, and I have to confess that Korovyev and Behemoth, with their gleeful mischief, are favourites of mine. In fact, it’s strange how M&M plays with your attitudes as a reader; you find yourself laughing with the bad guys as they burn and destroy; you want Pilate not to suffer any longer; you find yourself drawn to Woland despite his evil, as he actually seems more moral than the authorities in both cities. All of these elements intrigue and provoke, and I think on another re-read I will get even more from the book – there are so many subtleties and nuances. M&M is one of those rare books that’s so all-consuming that when you get to the end, you simply want to go back to the beginning and start reading it again so you can re-experience every wonderful part of it. Bulgakov really was a genius, pulling together so many different strands in this story to make something extremely powerful, a book that possesses you all the way through. If you haven’t read it yet, you need to read it at least once – it really will change your view of life forever. As an aside, the version I read this time was that translated by Burgin and O’Connor. There are several different translations (here’s a picture of some of the ones I have – the Glenny translation is not shown because I have an e-book version), and each seems to have its supporters and detractors. This particular translation seems extremely good to me; it captured the voice of the author in a way that sounded authentic to me as I compare it with the other Bulgakov books I’ve read. The translators drew on two versions of the book available (it was initially published in a censored version, and there were also changes made by Bulgakov’s widow), and there are notes at the back which clearly explain why choices were made at certain points. There is also excellent commentary by Ellendea Proffer which not only illuminates specifics which might puzzle the general reader, but also draws out themes and allusions which might not be clear to a modern-day Westerner. For example, the Master skirts round the issue of his treatment shortly before he goes to the clinic, but an authorial mention of the fact that his buttons had been removed from his jacket would signal to a contemporary Russian reader that he had undergone interrogation. The notes are not indicated in the text, which I rather liked as I often find them intrusive; instead they are given for each chapter at the end of the book and you can seek them out if you wish. On my readings so far, I’d highly recommend this version, but I hope to read the more recent Hugh Aplin translation next time and see what I think of that! It’s clear from the title page that we’re in complex territory, as the book is given a number of alternative titles, from “The Blame is Mine” to “A Tearful Tale”, and including that given on the cover. The story is that of a poor South American girl, Macabea. Born with all the disadvantages in life – not much in the way of brains or looks – she works as a fairly incompetent secretary in Rio de Janeiro and moons over her boss. Her main obsession is listening to a room-mate’s radio and memorising facts, which she spouts at any opportunity. Somehow, she manages to attract a somewhat thug-like admirer, but things do not go as she wishes. However, the book may not be about Macabea at all, for the narrator of her story, who makes it quite clear that he is the narrator, keeps interposing himself into the tale and pondering on the fate of the poor girl. He names himself as Rodrigo S.M. and alternates between authorial over-confidence and self-doubt. The lines between what is fiction and what is real, what comes from the author and the character, become blurred and the book challenges preconceptions about writing all the way through. 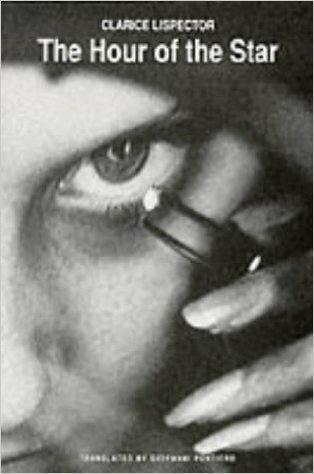 We gradually watch Macabea becoming revealed to us through the eyes of Rodrigo (or is it the eyes of Lispector, as she discusses the art of the author? ), and there’s a fascination in watching the whole compositional process. “Star” is an engrossing read and Macabea a tragic, moving character. You sense all the way through that she had the potential for so much more in her life which was crushed out of her by poverty, fear and a bad upbringing. And the author of Macabea’s story is also intriguing, shown as struggling with the creation of his work, inhabiting her mind and treating her as if she were a real person he knew. What is truth? What is fiction? The book throws up any number of metafictional questions about the process of writing while involving you in Macabea’s story. I have to say my thoughts were thoroughly provoked by my first read of Lispector! Her language and the structure of the story are complex, but the whole reading experience left me thinking deeply about the purpose of fiction, about what’s true and what’s not, and also about lives that could be so different if the circumstances were. I did enjoy my first experience of Lispector’s work and I’m sure it won’t be my last. 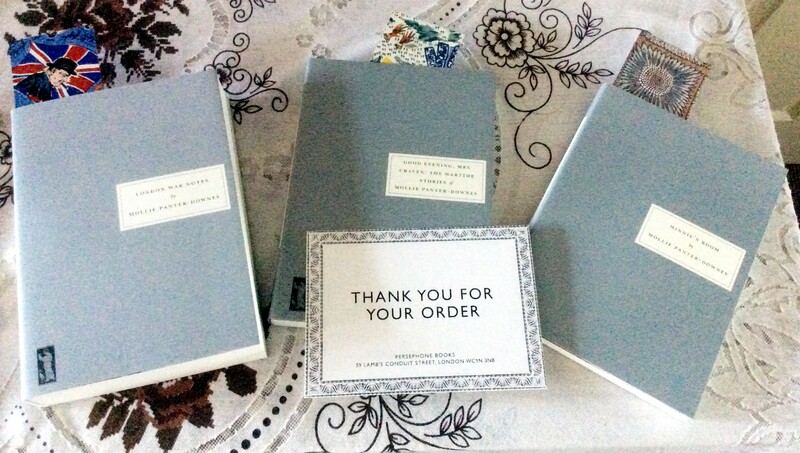 Bookish post from the lovely Persephone Books! 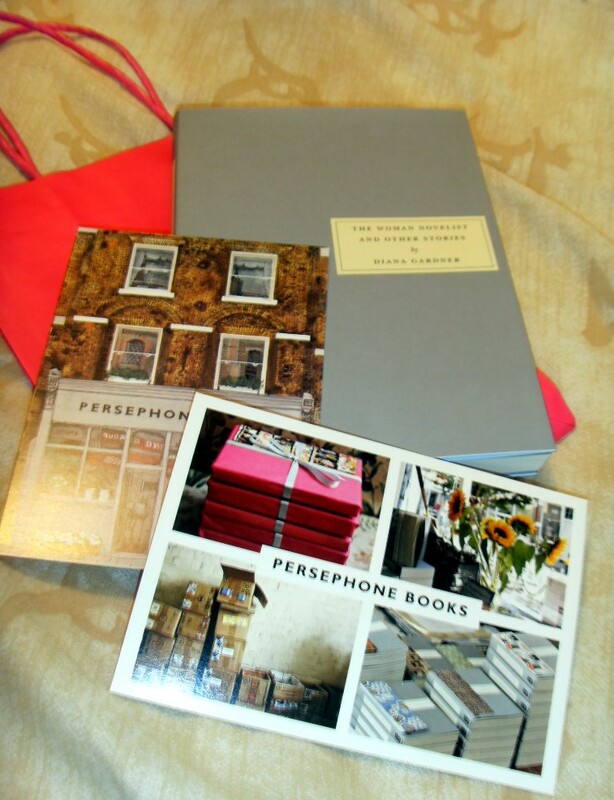 I’ve been trying to resist new book, I really have, and particularly the lovely Persephones as if I gave in, I’d want to purchase them all…. Aren’t they gorgeous??? I’m very excited about the London War Diaries as I *really* want to read this one. Now all I have to do is resist the temptation to put down the big books and start on one of these…. ! Guest Post! Demon Road, more like: Demon Whoa! Time for another guest post, this time from Youngest Child who’s been reading the new Derek Landy book, kindly provided by the publisher via NetGalley. Take it away, Youngest! 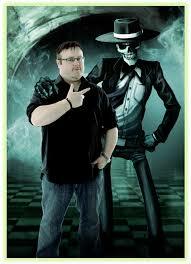 Derek Landy, best-selling author of the children’s series Skulduggery Pleasant, releases his new Book Demon Road, today. Youngest Child is here to review the new work of her favourite author, kindly procured by my dear mother. A lot of fangirling may ensue! Skulduggery Pleasant spanned 9 books, and fitted comfortably into genres of adventure and fantasy, bordering on horror at times. With the series ending in 2014, fans were eagerly awaiting Landy’s new series. Demon Road not only lives up to its predecessors, it achieves a mature sense of writing as well as providing thrilling action, tense stealth sequences and, of course, Landy’s classic sense of humour. The new work begins following the protagonist, Amber Lamont. We find her in the Principal’s office being reprimanded for ‘altercations’. In the first chapter we are introduced to Amber’s parents, Betty and Bill. Immediately we sense they enjoy power, and take pleasure in securing Amber’s education through threatening the Principal’s position. This sets the tone for the book. 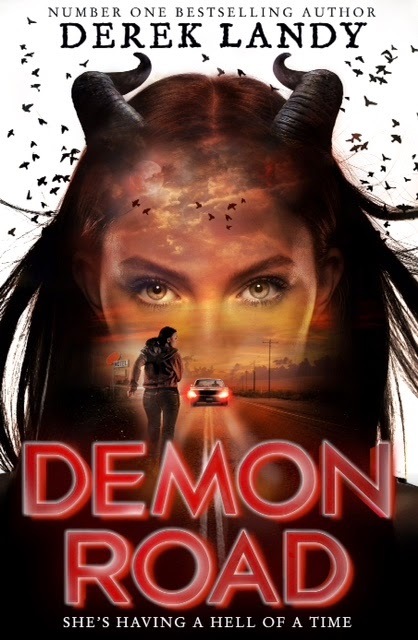 Amber will soon discover she is a demon, and that she must escape the murderous intent of her parents, who are also demons. Accompanied by bodyguard Milo Sebastian, she embarks on a desperate road trip across America to evade her parents and find a way to survive. As a long-standing fan of Landy, it was a welcome surprise to see him cater to a more mature audience. Skulduggery Pleasant was a series filled with humour, wit and sharp sarcasm, and as the series and its loyal readers grew, it took on a more sophisticated style to match the gravity of the plot. Demon Road, however, establishes itself as a story that addresses dark themes and more serious concepts. The violent and dangerous tone of the encounters is set in place within the preliminary chapters, and the weight of death is given close attention. Amber takes it upon herself to remember the names and faces of those she has come into conflict with. The very idea that parents are trying to murder their daughter for their own longevity was hard-hitting, and I was instantly rooting for Amber to find a way to survive. One of the concepts readers can relate to strongly in the book is Amber’s view of her image and femininity. When she is human, she is shameful and miserable about her appearance, which resonates with many people’s experience at some point in their life. However, she is empowered in her demon form: she’s strong, elegant and can protect herself. The action sequences are fluid, and instead of stuttering through them such as other thriller books, reading the scenes flows naturally, and the combat is believable. I think the aspect of the book I most enjoyed is subtle and not so subtle commentaries on women’s position in society, and the dangers they face. One scene that sticks in my mind is when Amber aids a distressed woman, who gets cat-called late at night. The harasser insists he is a, wait for it, ‘nice guy’ [Cue audience groan]. Amber calls him out, and educates him on how predatory cat-calling is, and that the woman did not owe him attention or thanks for an unsolicited compliment. It is gratifying to see Landy address this, as such a large portion of his readers are in their teens, and hopefully this message hits home about a societal issue that irks me to a gargantuan degree. Amber also has to deal with people comparing her dull, human form to her mesmerising demon form. Companion Glen constantly wishes her to transform, and is visibly disappointed when she remains in her human form. Landy communicates Amber’s feeling without overtly stating the way these instances make her feel, and the reader is provoked to feel indignant on Amber’s behalf. I’ve been a fan of Derek’s for the last 9 or so years, and I was apprehensive approaching his new series. Fortunately, I was absorbed in the plot and characters, and enjoyed the book as a departure from Skulduggery Pleasant. It was very much its own piece, and whilst the classic sense of humour was frequently utilised, the characters and sense of danger, threat and overcoming obstacles was dealt with differently to Skulduggery Pleasant. Furthermore, Amber felt far more down to earth, human and fallible. She was easy to relate to, being a believable character that grew on her journey, and was someone I wanted to root for. Derek is launching his book tour with an event in Hampstead. Sadly, I am not able to attend. The event is in the evening, and the lengthy train and tube journeys are not viable. I am not Amber. If something were to happen, even on the .1% chance I was in danger, I do not have a demon form to transform into. I am a 20-year-old woman, and travelling on an empty tube carriage late at night scares me more than demons and murderous parents. I do not want to encounter Amber’s cat-caller, and I can’t rely on someone to help me if I did. So hopefully Derek will tour again in March, and I can attend his events and moan at him for killing off my favourite characters! Thanks to Youngest Child for her review of Derek Landy’s book, out today, and also to publishers HarperCollins for making the book available via NetGalley. The hideous pun in the title belongs to Youngest Child…. The wonderful Persephone Books have issued a number of short story collections, but this was one that I had a particular interest in getting hold of. You see, many, many years ago (well, ok – in the 1980s) I was involved in running the Mervyn Peake Society, and early on in my tenure I was lucky enough to meet his widow Maeve Gilmore, shortly before her death. Myself and a group of friends were later invited to Maeve’s memorial service in London (an emotional affair that involved the four of us with one tissue between us…) and there we met Diana Gardner, who’d been a pupil of Mervyn’s and was a friend of the family. After the service, we trotted off to the nearby Royal Academy for some picture therapy, and bumped into Diana again. She recognised us from the memorial and we had a lovely chat. She was an inspiring woman, just off to spend the day painting, and so when I discovered there was a collection of her stories available I had to have it. Gardner had a fascinating life, mixing painting and writing, as well as working in publishing. And according to the Persephone blurb, she also knew Leonard and Virginia Woolf. “The Woman Novelist” collects a number of her stories, all of which were in an earlier volume apart from the title story. Short stories are often a difficult art to master, but Gardner certainly has, as this is a quite wonderful collection where each tale stands out distinctly in its own right. “The Land Girl” is possibly the best known, and it was her first story to be accepted for publication. It’s a clever, slightly acid tale, from the point of view of the girl of the title ( a city type sent to work on the farm) revealing the disruption she causes there. She’s a brilliantly unreliable narrator, and Gardner cleverly gives us the insight into a very selfish mind and a strong clash of cultures. Then there’s “Miss Carmichael’s Bed”, which has a mystery to it with an unexpected solution; “The Summer Holiday “, a tale that shows how some people just bury their heads in the sand (not literally…. ); “In the Boathouse”, an evocative tale of love and war; “Crossing the Atlantic”, a story of mismatched sailors; and many more, all fabulous. 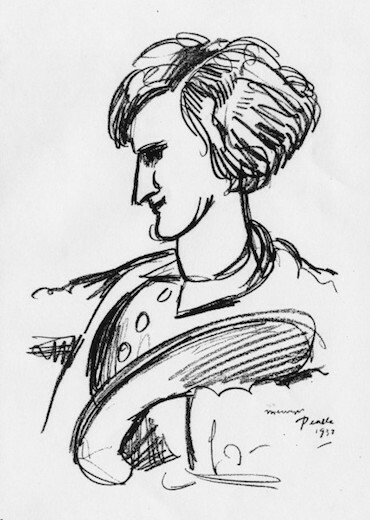 Portrait of Gardner by Peake, courtesy the Persephone Books site. The title story is absolutely brilliant; narrated by the Woman Novelist, it takes us through the tasks of her day as she tries to juggle the needs of an extended family who not only depend on her financially, but also physically and emotionally. The main bond she has is with a loyal maid who understands her problems and supports her as much as she can so she can write. The tale articulates brilliantly the problem women artists of all types have had in balancing the needs of their art with the often selfish demands of those around them – a situation a male artist would never be expected to tolerate. Gardner’s prose is excellent and I loved the way she played with the reader’s preconceptions. She’s brilliant at building up tension in a story only to twist the ending in a way you least expected. I’ve read many short story collections where the stories blur into one, but that doesn’t happen here – each tale is a distinct gem in its own right and there’s not a dud amongst them. 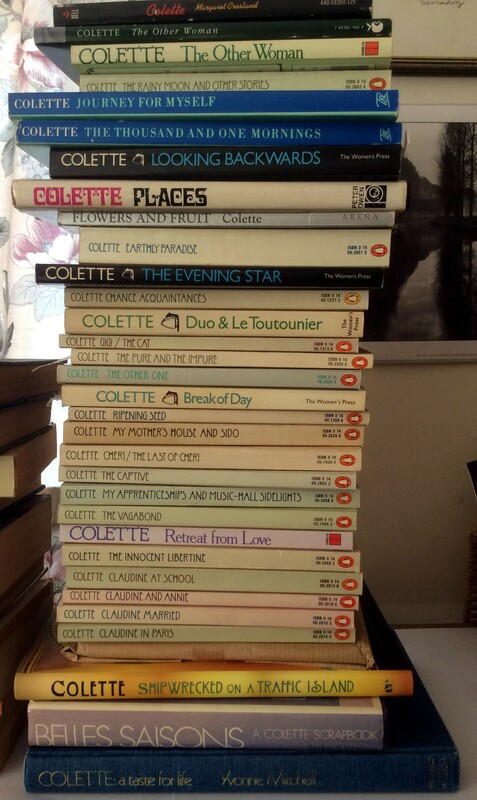 A Teetering Pile of Colette books…. Lest anyone should think I was making a big fuss about not being able to find Colette’s works, and that there are tons of her books out there and I just need to look harder – well, I thought I would post some pictures of books I *do* have so you could see that I have indeed searched out many but this is not everything she wrote! And here they are in all their glory – two piles, actually, and you’re meant to ignore the fact that I have three sets of the Claudine books…. 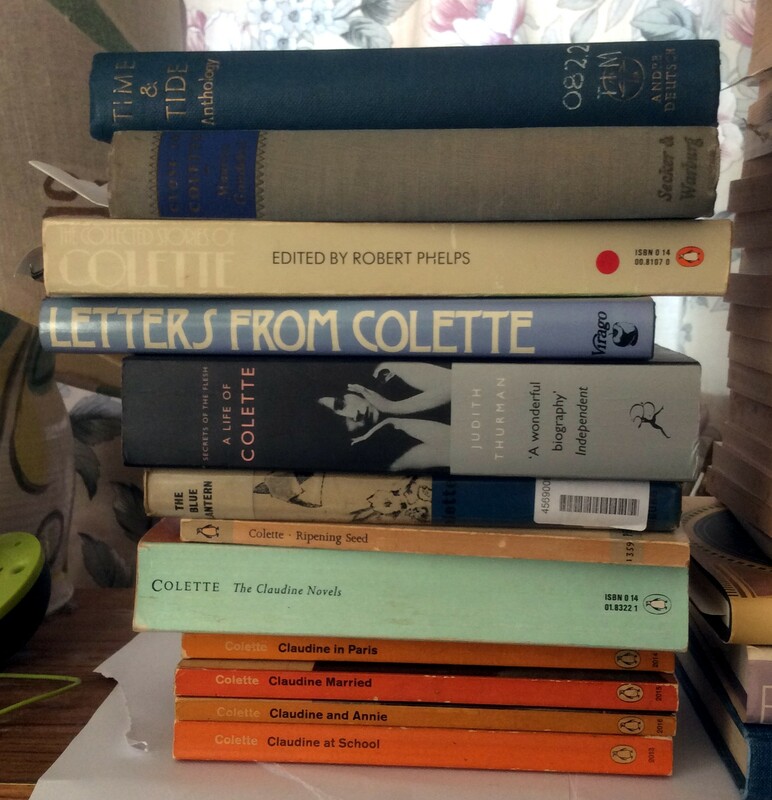 Here is pile 1 with some of the aforesaid multiple Claudines, plus biographies and books about Colette. 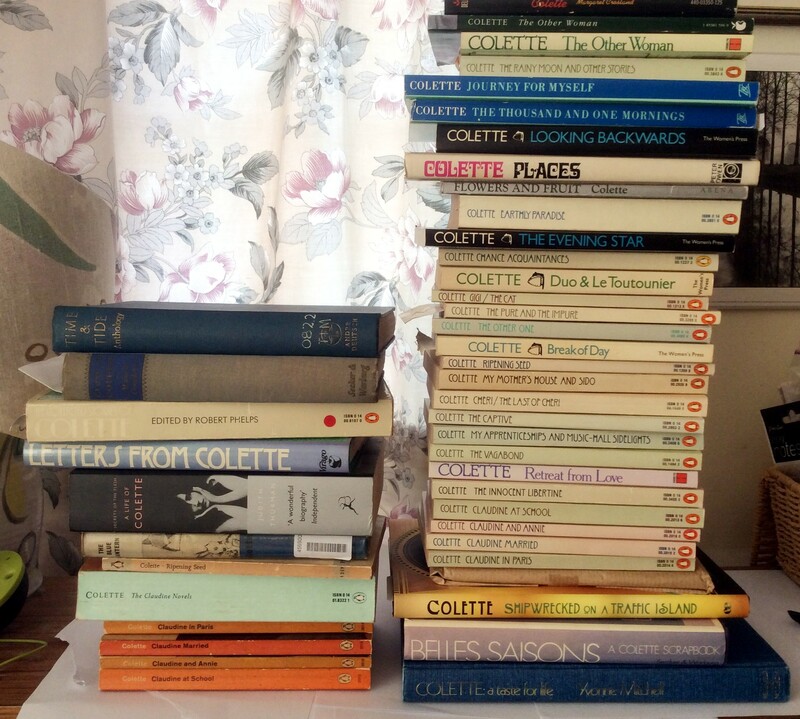 And here is pile 2 – more lovely books about Colette, plus the gorgeous Penguin matching editions of many of her works. But this is *not* everything she wrote – she was very prolific – and she most definitely deserves a complete works in English! 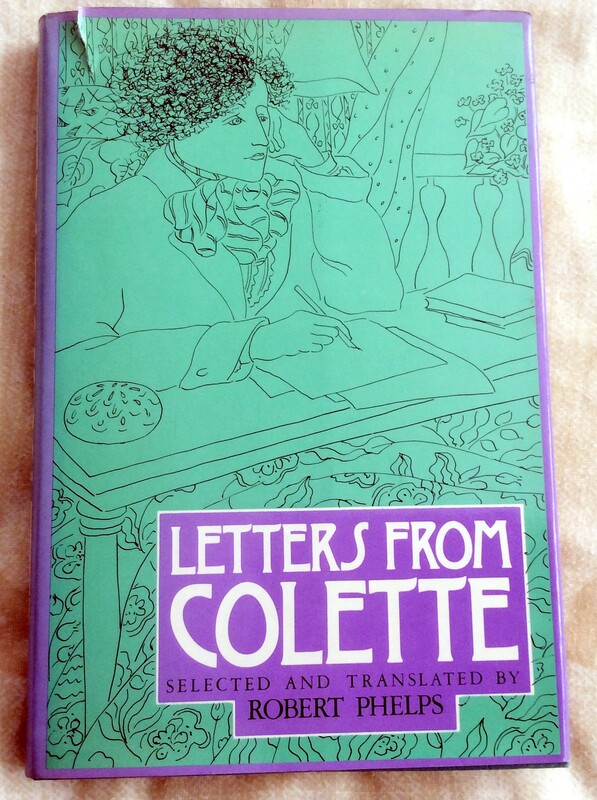 camilledefleurville commented about Colette’s letters on my last post, and I was sure I had some – which indeed I do, published by Virago. Alas it’s only selected letters but that’s better than nothing. Oddly enough, BuriedInPrint mentioned Robert Phelps in a comment, and oddly enough Robert Phelps has translated more than just this Colette, so there’s another spooky link! 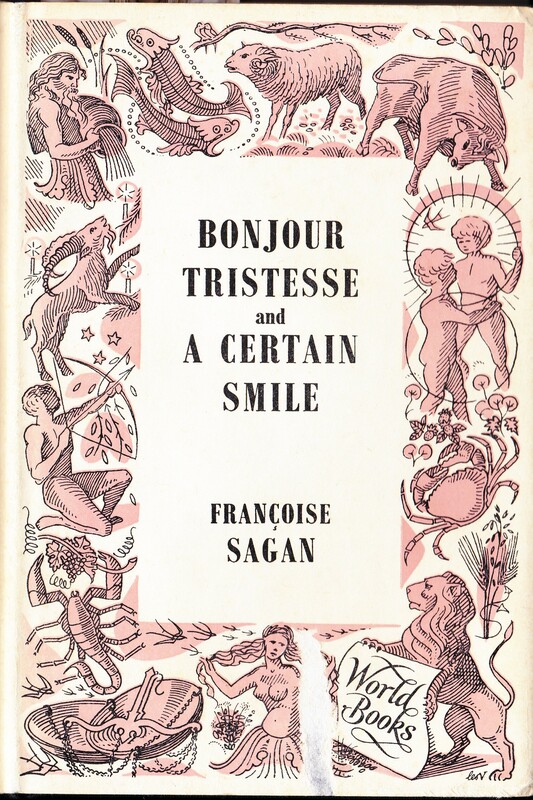 Francois Sagan caused quite a sensation on the publication of her first novel, “Bonjour Tristesse“, in 1954 when she was just 18. Her second book, “A Certain Smile” followed in 1956 and was equally controversial. My copies of the stories are in one lovely World Books volume and WIT month seemed like a good time to pick it up. “A Certain Smile” is narrated by Dominique, a young woman studying law in Paris at the Sorbonne. It is the 1950s and she spends much of her time with her lover Bertrand in what is recognisably a cafe society. The couple jog along, but there is a sense that Dominique is somewhat detached from life and love, and her relationship with Bertrand doesn’t strike the reader as having great passion. However, when she meets Bertrand’s uncle Luc and Luc’s wife Francoise, things change dramatically. On the surface, then, this is a seemingly straightforward novel about a younger woman having an affair with an older man. However, there are undercurrents. Dominique is a complicated character, seemingly indifferent to much around her and driven by a kind of existentialist ennui. In fact, boredom seems to be the strongest motivating force – neither Dominique nor Luc can bear to be bored, and this is what attracts them to each other and eventually unites them. And Bertrand is, frankly, boring. Even though he’s young and good-looking, the older, uglier Luc is more attractive – perhaps because of his air of worldly weariness, perhaps just because Dominique recognises a kindred soul. Her behaviour could seem callous; after all, she’s betraying Francoise, who’s become very attached to her, as well as Bertrand. But Luc has had affairs before, and probably will continue to do so; whereas Dominique is ready to fall in love, and is tormented because she knows Luc cannot and will not love her, and there’s no question of him leaving his wife. Inevitably, Bertrand and Dominique split. The affair with Luc comes out, and then ends, and Dominique is left to pick up the threads of her life again. Happiness is like a flat plain without landmarks. That is why I have no precise memory of my stay in Cannes except those few unhappy moments, Luc’s laughter, and the pathetic scent of fading mimosa in our room at night. Perhaps, for people like myself, happiness signifies a bolder attitude towards the tedium of everyday existence. “A Certain Smile” is an absorbing novel, lifted above realms of just romantic fiction by Sagan’s writing, her evocation of place and time, and the dimension she allows her characters. All are well-developed and believable, all struggling with the business of living, and the story is entirely convincing. Her understanding of the problem that boredom with life can be is striking; something of a first-world problem, maybe, but a very real one. If I have any reservations it would be that there’s a distance here somewhere, a slight coldness in the book that kept me from feeling a real warmth and sympathy towards Dominique, but I haven’t quite worked out where that comes from. Nevertheless, I’ve enjoyed my sojourn in 1950s France and I’m sure I’ll be returning to the other Sagans I have!